Google Play Music All Access subscribers should have a hop in their step now that word is out the All Access Music app is finally available on iOS. The search giant's music service has always been available on the competing platform through an HTML 5-enabled browser app, but Google just released a full-fledged app for Apple devices. 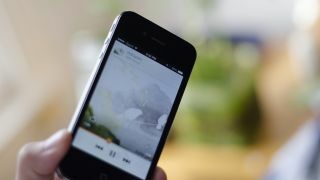 Users can expect the same free, standard Google Play Music service that lets them stream internet radio and upload up to 20,000 tracks to their music collection in the cloud. Google is also offering a free month of All Access streaming service, which normally costs $9.99/month (£9.99 or about AU$11.99). But this offer is only being extended to new users that haven't already used up their free service trial. All Access grants a pass to over 20 million tracks with custom radio stations to help music lovers discover new songs through "smart recommendations." Google's paid music service lets you download up to 20,000 tunes for listening offline on your devices as well. Chromecast owners will be glad to hear the new iOS app can cast music wireless from Apple products to a TV. Oddly enough the only thing that seems to be missing on the app is the ability to buy songs. For now, the iOS app only comes as an iPhone version made for smaller screens, but Google is probably cooking up a higher-resolution variant for iPads that won't look quite as blown up. Google's all-you-can-eat music app joins an iOS ecosystem where there are already a number of services that do just about the same thing. Spotify offers nearly the same service for $10 (about £6.21/AU$10.68) with unlimited streaming and the ability to download up to 3,333 songs across three registered devices. If just streaming is more your speed, Rdio's $10 (about £6.21/AU$10.68) plan has unlimited web and mobile music streaming. The service however, does not include an option for offline listening. For the cost of nothing at all, Pandora offers unlimited internet radio offset by a set number of song skips and ads. To help banish those annoyances, users can also pay $3.99 (about £2.47/AU$4.26) a month for the premium Pandora One service. This grants listeners six skips, higher-quality audio, and the Pandora One Desktop App. Here's a list of PS4 games you should be playing on day one.